Americans would bomb fictional places. Why is the UK allied with them? ake a good, hard look at the graph. 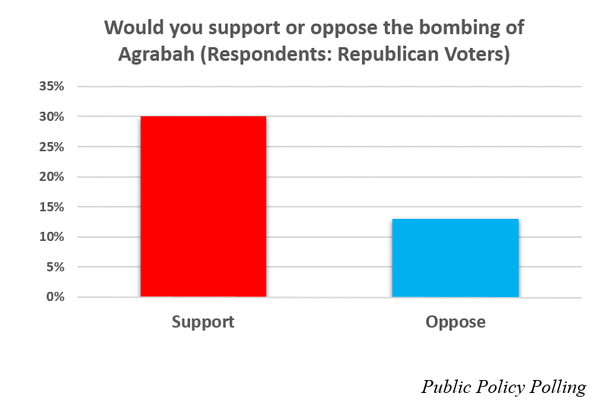 It is from a poll showing that Republicans in the United States would happily support the bombing of Agrabah. Perhaps you think that’s okay. You may not know where Agrabah is or what its people have done to offend the Americans, but you might be fine with it. … Right up to the moment when you realise what Agrabah really is. Some of you will know already. You see, Agrabah is the fictional city in the Disney version of Aladdin. Does that put a different complexion on it? Admittedly, the current US administration is Democrat, but isn’t it cause for concern that the UK is now in an alliance with that country, bombing the very real nation of Syria? American polits have never been outstanding geographers and for many of them it seems that one place name sounds just like many others. Perhaps they ought to turn to their Samuel Butlers and bomb Erewhon? The Americans know little of the world outside? Agrabad, part of Chittagong in Bangladesh – Aladdin indeed. Why would anybody want to bomb part of Chittagong in Bangladesh? The question was a deliberate reference to the Aladdin setting, posed as a trap to catch the ignorant. And it worked SO well! Ah the penny is beginning to drop – this is not a spoof and we can only assume that Agrabah was thought to be in the Syrian conflict scenario. The Democrat voters also did quite badly. But, to be honest, its difficult to say if they were less against bombing Agrabad because they are less in favour of bombing in general or because they knew it didn’t exist. I have to say that I would have been unlikely to have known it was a fictional place myself, without looking it up on line, as I have never read the story. My answer would have been “No bomb”, then realised I’d been taken for a ride after a little googling. This is it, though – if you don’t know where a place is, or even whether it exists at all, then why would you want to bomb it? If I have understood this post Mike, the whole point was that republicans were fine about bombing anything that might be Syrian or Iraqi or just US hit list Muslim targets? I am further assuming that these people really didn’t know or care who or where? No one would to vote to bomb somewhere with out first understanding the reasons put forward for so doing. Would they?